I often think about little Charles and his mum, and how he hated books so much! And I felt like him as I was sitting on the BTS Skytrain in Bangkok a few years ago. Charles was three and a half when I first met him, and he had speech and language delay. He attended a local nursery school, and I was sharing ideas with staff about how to support his language development. Now I really enjoy sharing books with children, and can usually find a way to get children involved and talking. Not so with Charles. When I asked him to share a story with me he became panic stricken. He shouted ‘No! No! No!’ and ran outside to play on the bikes. I had a chat with his mum about Charles and books. Mum told me that she was teaching him how to read. Most evenings she would sit him down and make him chant the alphabet, then make him write his name, then make him repeat words from the storybook that had been sent home from the nursery. Now this situation was no one’s fault. Mum was doing what she thought was best to support her son’s language development and understanding of reading. But the whole experience was very negative, and as a result little Charles had rapidly seen books as the work of the devil! So what to do? To Mum’s credit, she stopped the handwriting practice and reciting the alphabet, but still wanted to help Charles with his reading. This still wasn’t working, as Charles would panic every time he saw the books come out. So we suggested to Mum, ‘Instead of reading the book, why not just talk about the pictures?’ This did not work. By chance I attended a talk by Emma Nicolls, who was outlining the findings from her Doctorate on supporting children’s reading and language development. It was a revelation! One strand of Emma’s research was exploring the possibility that a key factor in children’s failure to read effectively is their lack of interest in the books they are being given to read, leading to lack of practice. (Of course I’m doing Emma’s research a huge disfavour by condensing it down to a sentence, but this is a blog, after all!) Emma involved children from Reception and Year 1 in regular sessions where they could talk about books that were of high interest: about sharks, dinosaurs, sport etc. The key point was that all these books were non-fiction. They had photos and diagrams and were very exciting to talk about. Not only that: many of them had a reading level way in advance of what the children would be able to read. Emma’s purpose was to engage the children in conversation about books. These were real conversations, because they were based on subjects that children already knew about. At the beginning of the research the children’s understanding of vocabulary was tested. When re-tested, the children in her research group showed a significant improvement in their understanding of vocabulary, even though the items on the test were not featured in any of the books the children had been sharing. What seems to have happened was that the children’s regular involvement in sessions where they could have a meaningful conversation about something they knew about, with an adult who had time to listen, stimulated their language development in general… and rekindled their interest in books. So where does the Bangkok Skytrain come in? Well I was in Bangkok, leading training in schools and nurseries, and I bought a Thai children’s picture story book. I was sitting on the Skytrain trying to make sense of the book by ‘just looking at the pictures.’ It was a very annoying experience. I couldn’t read the text, so had to guess what was going on. What was the rooster doing? What exactly did the hen say to him? And what was the funny song they all sang at the end? It looked like a really good book, but it just wasn’t floating my boat because I couldn’t work out the story… I needed to be able to read the text. I tried to make up my own story, but it wasn’t doing it for me. So I started looking at the station names on the map, which were in Thai and English, so I could try and make some sense of the text. What I needed was a good non-fiction book, with lots of photos! This would have made more sense, and made me feel better about wanting to learn Thai. Actually what I needed was to concentrate on where I was going, because I missed my stop, got lost, and ended up in a taxi taking me in the opposite direction to where I needed to go. 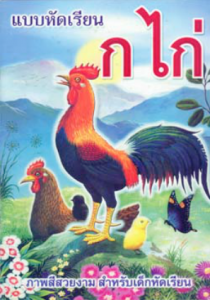 So just like Charles, I panicked and swore I’d never look at a Thai storybook again! So I came to feel, for myself, what Emma explored in her research: you can’t ‘just talk about the pictures’ in a storybook. It has to make sense, and you need to follow each page in sequence otherwise you lose the plot… literally! On the other hand, you can have a really good conversation about any page taken at random in a non-fiction book, because every page will make sense, as long as it is a subject you know something about in the first place. By the way, Charles came to really like books. We found lots of non-fiction books about the emergency services-his favourite subject-and shared them with him in nursery, and Mum did the same at home. But we had to do something about how we shared the books. Which is the subject of my next blog. The Contribution of the Shared Reading of Expository Books to the Development of Language and Literacy: Emma Nicolls. Unpublished PhD Thesis, University of Oxford, 2004. I can relate to the above story due to my childhood experience. We do need to focus more on children’s interests and how best we can support them. I will go back & look through our books on Monday and talk to the team with a copy of your blog. you have to find an object among many. Non fiction books are usually hardback and with colour illustrations, which makes them double the price of a paperback storybook. However, and I’m serious about this, you can often find quality non-fiction books for young children in Poundstretcher, Poundland etc. PS The absolutely most exciting thing for young children is a magazine with their favourite characters in, as you will find out when I come to visit you! Love it Michael. Given me a kick up the back side and reminded me what I should be doing!!! Have got a little 4 year old boy who has quite poor speaking and understanding I will be doing this with. Operation Spiderman next week!! Give my regards to Tilbury!! I still have very fond memories of our outdoor ‘stones and shovels and buckets’ day! Succinct, entertaining, and revelatory as always Michael. Thanks for sharing. Thanks for your comments. I can tell you that I was far from ‘succinct and revelatory’ when I was working in Bangkok. It’s a transport nightmare!! Give me Goole any day! Yet another thoroughly engaging and thought provoking blog! Reading this makes me realise that we really do need to afford children the time and encouragement to learn how to read by allowing them to make their own choices and not to be ‘afraid’ to take their lead. As a new mum it has given me lots to ponder! Thank you for your generous comments. I helped a setting in Thurrock give their book corner a ‘makeover’, and at it’s grand opening they asked parents to donate/bring in the books and magazines the family like to read. That was a real eye opener, and the children loved having magazines like ‘Total Carp’ (I kid you not, Thurrock is a place where big men take their little boys to catch big fish, and then lovingly throw the fish back) in the book area. A good point well made by Michael to pay tribute to the humble non fiction book who so often plays second fiddle. Sharing a book can be some much more than reading a story and one of the key points made seems to be that both the adult and the child need to be relaxed. Not perhaps rushing the reading book before school in order to sign the seemingly all important reading diary?? Great post! Starting with children’s interests, you can’t go wrong with that mantra! Thankyou for sharing. It’s not so easy for teachers to allow children to follow their individual interests now, with the very prescribed curriculum. You have to wait until you go to university to get that freedom back in learning! Michael thank you for sharing this experience. I can relate very well to the situations you share. My dyslexic son had great difficulty with reading and struggled at school reading fiction books that were not age appropriate and did not hold his interest. I have conducted research onto the collaborative relationships with children and your own experience sends a significant message. When authors write books they have a view in their mind of the story they want to tell. We as readers may have our own interpretation so pictures hold much meaning. On a simplistic level, theories proposed by the likes of Piaget (I am thinking of the three mountain task) that argue children are essentially egocentric (they could not see things from another’s viewpoint) have been criticised in terms of it is not that the child cannot understand but rather it is the language we use they cannot understand. As such are some authors egocentric in terms of their own writing? Talking about pictures in books is a valuable tool as it gives an insight into the child’s mind as they apply their own interpretations. Yes, I take your point entirely. Some children (and adults) just prefer non-fiction. I have a friend who never reads novels. He says he gets all the fiction he needs from watching DVDs. Thank you for sharing your frustration-I had a similar experience with a Russian story.I find that sharing the opportunity with young children to talk about Artist’s work produces amazing results,it frees them up to make up their own stories/choose their own pictures which THEY find interesting. Some children just prefer non-ficyoon books This can be a bit disappointing for parents, who want to read a bedtime STORY, but their children would prefer to share a book about trains! Why do I keep saying ‘he’? I really enjoyed reading your story. I was just working on children who have dyslexia and how it is not picked up in nurseries,children with dyslexia find it difficult to read or concentrate so we need to find different ways in which they can tell a story. But many a time I feel children do not enjoy books with too many words and they prefer to look at the picture. We have invested in a number of non-fiction books, even out 2 year olds like looking at the picturers and making up a story. Great to hear from you again! Is your setting still as wonderful as ever? Very best wishes from Michael!! Great blog post Michael which made me laugh out loud in parts. It is actually very timely as I was talking to a friend about the difficulty of finding books which interest children especially when they first learn to read. Much of what is out there, especially some of the school reading schemes are simply not that interesting, and so even once a child has read the book, it not much of a reward. I agree with you about non-fiction books as this really brings the book alive and a carefully chosen title can make a big difference. Keep up the great storytelling!